How does a total prize pool of $3 Million sound? And...the 1st place winner walks away with a check for $1 Million! Well you can become a millionaire for just $33! The DraftKings Fantasy Golf Millionaire is the world's biggest fantasy golf contest and it's back for 2017! Full details can be found here: DraftKings.com. 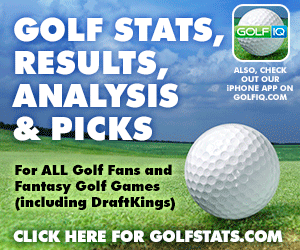 Note - We are partners with DraftKings and receive compensation for new players joining through our links. This helps us to provide quality content to our followers. Fantasy Golf qualifier contests run daily until the week of the 4th Major of 2017, which starts August 10th, 2017 and you can qualify for as little as $0.25 or directly buy-in for $33. 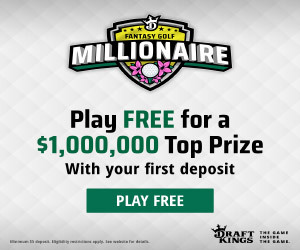 The DraftKings Fantasy Golf Millionaire Contest will cover all four rounds of the 2017 Tournament at Quail Hollow and you can get in on the action now! All 4 contests for the majors last year filled up 8 hours before the tournament started. In fact, there was so much demand, they started a new $400K golf contest! In other words...GET YOUR FANTASY GOLF LINEUP ENTRY RESERVED EARLY! The first place winner will walk away with $1 Million and 2nd place will win $150,000. The Top 24,970 finishers will win real cash prizes so the odds are in your favour if you can enter not just one but have the bankroll for multiple lineups. You can’t win the big payday if you don’t play so take a lesson from Brett Marino, a Phillipsburg police officer...he qualified for the 2015 Contest by entering into a $5 qualifier contest. It was his only entry into the Fantasy Golf Millionaire contest…and he won! $1M for $5, how's that for a return on investment. You do not need to be a fantasy golf expert to win, do some research, take your shot and hopefully walk a way a winner.